Our quick introduction to Enescu’s only opera and his masterpiece, inspired by the Greek tragedy of Oedipus. Oedipe’s parents’ happiness at his birth is destroyed when the prophet Tirésias announces that the child will kill his father Laïos and marry his mother Jocaste. Oedipe is sent away to be killed. However, a shepherd rescues him and he is reared in ignorance of his origins by King Polybos and Queen Mérope of Corinth, as their son. Twenty years later, Oedipe learns of the prophecy. His ensuing actions bring about rather than prevent its fulfillment. Romanian composer George Enescu’s only opera, with a libretto by Edmond Fleg, was inspired by the Greek myth of Oedipus. The opera recounts over four acts the Greek hero’s life from birth to death. Acts I and II present events from the legend of Oedipus previously undramatized. The principal sources for Acts III and IV were Sophocles’ great tragedies Oedipus Tyrannus (Oedipus the King), which was adapted by many great playwrights as well as by Stravinsky in his Oedipus Rex, and Oedipus at Colonus, a lesser known work that shows Oedipe making peace with Fate and the gods, then dying serenely. Oedipe was Enescu’s most ambitious work, and many consider it his masterpiece. He began to make sketches for it in 1910 after he saw a production of Oedipus Tyrannus; he completed the opera some twenty years later in 1931. Oedipe’s premiere in 1936 was a success, but World War II halted its progress as a repertory work. 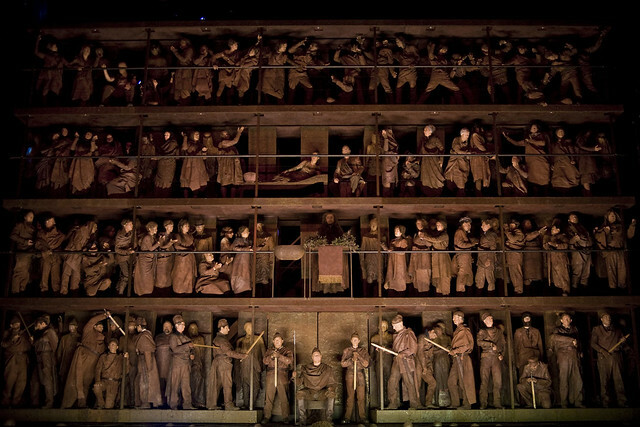 Oedipe began to be more regularly performed in Romania from the 1950s; performances in Western Europe are growing in number. This is The Royal Opera’s first production. Enescu’s score is richly varied. He makes expressive use of folk music in Act I, and in the Shepherd’s pipe music in Act II. There are eerie orchestral effects for the riddles scene and the Sphinx’s death – including the use of a musical saw. Finally, there is radiant music for the closing scene, in which Oedipe realizes that he has come to terms with Fate. This production by Àlex Ollé and Valentina Carrasco explores the nature of time, showing that our notion of temporality is limited. Oedipe is an ‘eternal’ figure who exists outside traditional concepts of time, and who correspondingly moves through different epochs as his life progresses – from the antiquity of the first scene to the contemporary inflections of the opera’s conclusion. Throughout the production, red clay – symbolizing not only the myth of man’s creation from clay, and classical statuary, but ecological disasters that show our lack of control over our environment – plays a major role in the designs and staging. The production was originally made for La Monnaie, Brussels, and is given with generous support from the Monument Trust, Richard and Ginny Salter, the Romanian Cultural Institute and the Friends of Covent Garden. It all sounds extremely exciting. It's just that your advertising picture is so purposely disgusting that I am wondering whether I want to see the production behind it. Listening to a recording of the whole opera as I write I can report that the music is very easy to enjoy (very much in the romantic idiom) and first class. This is the first time for the last 10 years my friend and I left the opera. First 15 min of the performance were promising, but when time shifted to the modern construction scene (workers in yellow vests singing about Zeus) and Oedipe in rubbish singing about Aphrodite, we were shocked. The lights suddenly blinded the audience, so nobody could clearly see the killing scene. This is by far the most weird cheap modern production. Taking into account the complexity of the music, one would expect the best opera house in the country to deliver the feeling of the era. And why Alex Olle and Valentine Carrasco want us to think about "our lack of control over our environment" (from the opera brochure)?